Are you filming a movie and need a bus? We are happy to rent out our buses, with driver, to you for a great rate. 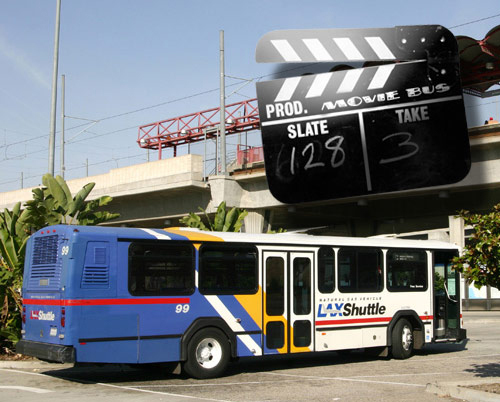 Whether you're wanting a large bus to hide part of a location to make it indistinct (airports are a great example of using buses with fake lettering), or to simply have a school bus drive through your shot, we've got the buses and the time to help you produce your next blockbuster movie! We have a vast range of movie buses for rent, various sizes, colors, old and new. Commercial rentals, school bus rentals and even the super large tour buses are for rent too. 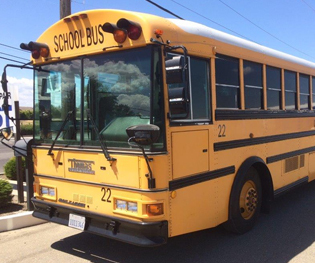 We have two primary bus locations that house our rental stock fleet. One location is in Carson, very convenient for filming in the greater Los Angeles areas & Orange County. Our other locale is out in Fontana, for those desert scenes (oh, we could probably even rent some heavy duty trucks too, our sister divisions are truck dealerships). We want to be your sole provider for large vehicle rentals for your movie. Call us and we can help you with your movie bus requirements.